Here is a talk that cuts right to heart of what Catholic education is about. The New Liturgical Movement’s own Jennifer Donelson is giving the next Catholic Artists Society lecture in New York City on December 10th. This is a topic that is close to my heart. A lot of painters come to me asking about how they can get a formation as a painter. I always say that the most important thing is the worship of God in the sacred liturgy. That is not to rule out other aspects of an artist’s training, of course, but without a connection to the primary source, the artist is cutting himself off from the main font of inspiration that is available to him to direct his brush on the canvas, and to the wisdom that will guide him in the choices he makes in his own formation. It is a topic that also comes up in discussions about education in general. Some people who favor a “great books” education seem to forget, it often seems to me, that the worthy books that are studied are the result of inspiration. In that sense they are secondary sources. 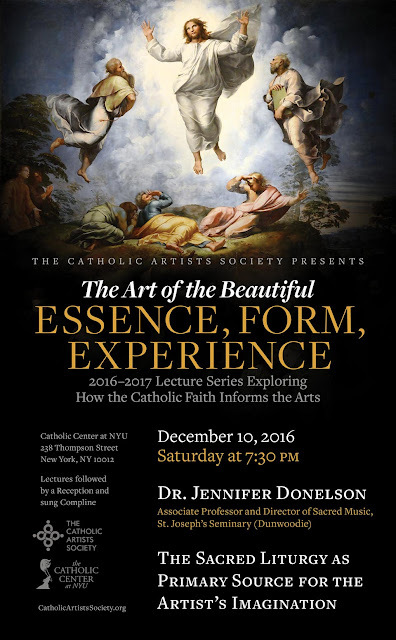 The goal of studying them is to give students both an appreciation of their content, and an understanding that such wonderful works emanate from a source of inspiration, a source which, as Catholics, they have access to in ways that sometimes was not open to the original authors of the books themselves. This should, in my opinion, inspire us to look at these works and think that we could not merely equal, but even surpass them. The person who is satisfied in the study of such works of the past, and does not see them as pointing to something greater, the worship of God in the liturgy, is like the one who savors the smell of the meal but never actually eats. A Catholic inculturation, therefore, does not necessarily require a student to be immersed in the full range of the canon of great books; it can be sufficient to grasp the point that the liturgy is the wellspring of creativity, the place of the universal Christian culture. I know no more about what Jennifer is going to say than the title, but these are the thoughts that cross my mind as I ponder over this extremely important topic. Please go if you can.